However, I'm not going to start with the festival, not even with Islay. Instead I'm going to take you to the gardens at ardfin over on Jura. There's also some mead magic and a ‘report’ from the Jura fell race on the same blog. Others went to Jura for the whisky, Dubber & Clutch to be precise. After an interesting crossing they had dinner at The Antlers followed by some whisky and went to a ceilidh. There was a Tour of Jura Distillery with a Sneak preview: SSS before they had a chat with Jamie on island life. On their way out they managed to squeeze in a Feis Ile stopover. (Day 3 on Islay...) were his posts so far before having to leave again for the long journey back home. The guys from caskstrength.net teamed up with The Whisky Exchange Blog and a lot of cross posting went on: Day One, Day two, Day three, Day Four, Day Five, Day Six and Day Seven. Want the same again? OK, here we go: Day One, Day Two, Day Three, Day Four, Day Five, Day Six and Day Seven. There are also quite a few reports and videos from The Ileach on Ron's Islay Weblog, including the Homecoming Parade in Bowmore and Islay Festival Diary Monday 25 May. He also squeezed in Cuiart Breac, A Wild Trout Odyssey from Jeremy Hastings. While not technically a blog Gordon of Spirit of Islay has posted chronological updates from Feis Ile on his website. One of the biggest events of the week was probably the auction of the first bottle of Kilchoman distillery, also mentioned here on this blog. While they didn't make it to the festival the Edinburgh Whisky Blog claimed they lost the Kilchoman auction (and have a Islay festival guest blogger). The auction also made it into a whisky blog from Israel, although I have no idea what she writes about it (I'm guessing it's a she from the Twitter profile picture). 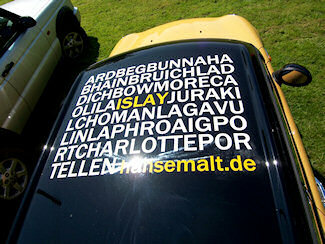 The Bruichladdich Blog also mentions Kilchoman’s First and obviously reports from the Bruichladdich Day “Feis Ile” 2009. The Scotch Hobbyist has been following the festival quite keenly, as you can probably see from his Following Feis Ile 2009 post. While he was at it he also had a Flashback: My first Islay malt (Laphroaig 10). That was before Comparing Caol Ila 12 and 18. Not exclusively about the festival (and I'm not entirely sure if they picked this week on purpose for the festival) is the OOR ALBA BLOG by Mike and Jacqueline from America. I believe they mainly came to explore their Scottish roots, but after their first day on Islay just enjoyed the festival and the place with American monument, Finlaggan, Port Nahaven or Another open day, lunch from Nippy Chippy, beach at Machir Bay, ceilidh. There's a picture of Bruichladdich on Photogenic Scotland and an Italian (wine?) blog writes about La degustazione dei whisky Laphroaig alla Terrazza Martini di Milano, there are also some pictures and videos. On the Islay Birds blog we find this picture of Cuckoo and first news of the Corncrake count. While it's difficult to see them some can at least hear the Corncrakes. John Islay Birder Armitage provides us with a summary of three busy bird-, moth-, and butterflywatching days and news of young birds and Painted Lady butterflies. Elliott of Islay Sea Shipping had a busy weekend (getting all the festival visitors safely back on the ferries I guess), his updates are to follow. The photographers were busy as well: In what looks like the last few pictures from his Islay visit Mirko Herzner shows us Port Ellen distillery and Port Ellen harbour. On Mark Unsworth's Islay Photography Gallery we find Whisky Still Cleaning at Bunnahabhain and a different view of Bowmore Harbour (I think that was taken from the crane also used for the Homecoming Parade picture). Of my own pictures on my Islay Pictures photoblog I think my favourites are Queen Street in Portnahaven and Sailing Boat Anchored on Loch Indaal, Isle of Islay.